You deserve a gift. And we’ve got one in the form of a deal. 2018 has been a good year for our documentary. 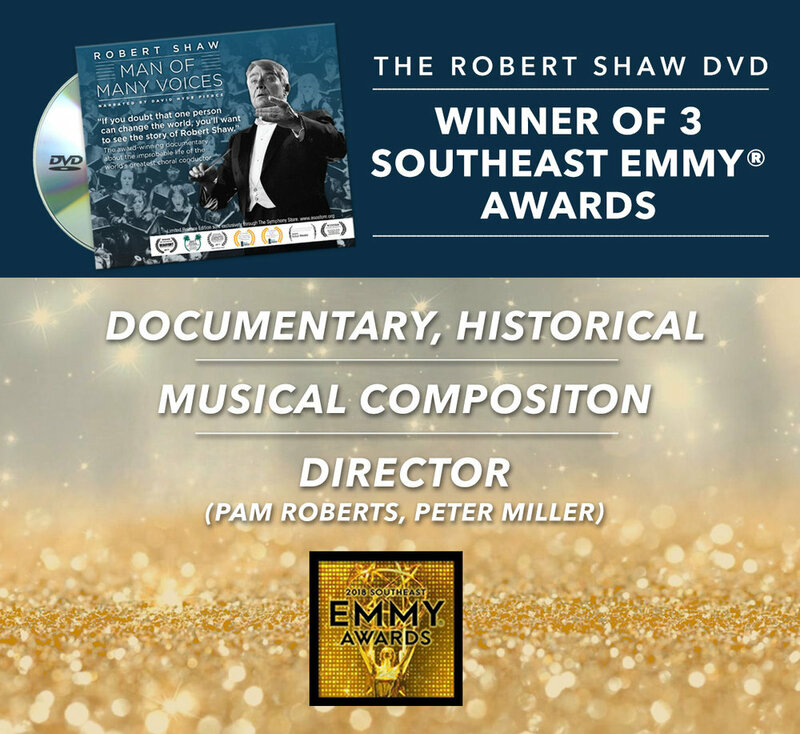 "Robert Shaw - Man of Many Voices" won three Southeast EMMY Awards this summer and is slated now to air on PBS' American Masters in 2019. Those are big accomplishments! So, we are providing FREE SHIPPING (a $5.95 value) on orders placed for the DVD through the holiday season (and for us, that means the Epiphany, January 6th). The Shaw DVD is only available through the Symphony Store in Atlanta. Just go to https://www.asostore.org/products/robert-shaw-dvd and apply the code FREESHIP when you order the Robert Shaw DVD. If you order by next Wednesday, December 19th, you can still get it by Christmas but the discount code is valid through January 6th. so you can celebrate all twelve days of Christmas. Or whichever holiday suits you best. Posted on December 13, 2018 by Web Master and tagged DVD Promo Symphony Store. Winner of 3 SE EMMY Awards!!! Congratulations to the Robert Shaw film team! Winners of three Southeast EMMY Awards! Posted on June 17, 2018 by Web Master and tagged Emmys Winner award Kiki Wilson David Druckenmiller Pam Roberts Peter Miller Amy Linton Fred Story. November 4, 2017 – The award-winning documentary Robert Shaw - Man of Many Voices is coming to the Atlanta airwaves via Georgia Public Broadcasting’s November schedule. The locally produced film which features such Atlanta institutions as the Morehouse College Glee Club, the Atlanta Symphony Orchestra Chorus and the Atlanta Young Singers will initially air Monday, November 13th at 8 PM. This presentation of the film will be supplemented with rarely presented selections of Robert Shaw conducting the annual ASO Christmas concert in two separate occasions. These feature the Atlanta Symphony Orchestra and Chorus of course but also the Morehouse College Glee Club and the Atlanta Young Singers of Callanwolde and the Gwinnett Young Singers. These recordings, although not externally available, are the most requested according to the ASO’s Symphony Store. Having already received three Best Documentary awards, a Best Music award plus a Best of Fest and several other awards in the past several months, the film is still enjoying film festival invitations well into 2018. Robert Shaw – Man of Many Voices has also recently earned the Los Angeles Independent Film Reviews’ 2017 Gold Award. The film, about the extraordinary life of America's internationally revered choral and orchestral conductor, is currently making the film festival circuit. Robert Shaw was an American conductor most famous for his work with his namesake Chorale, with the Cleveland Orchestra and Chorus, as well as the Atlanta Symphony Orchestra and Chorus. During his lifetime, Shaw received 16 Grammy awards, four ASCAP awards for service to contemporary music, the first Guggenheim Fellowship ever awarded to a conductor, and was a 1991 recipient of the Kennedy Center Honors. Robert Shaw’s impact went beyond the musical world. As the documentary shows, his influence extended into international relations and into the civil rights arena as well. The film explores his forays into the South with racially integrated choruses as well as his reasoning for bringing his already impressive musical influence to Atlanta in the 1960s. Emmy Award-winning actor, David Hyde Pierce, narrates the film from Mr. Shaw’s modest beginnings through his improbable but meteoric rise to national stardom and international acclaim. The choral world’s fascination with Robert Shaw’s techniques are only slightly matched by the music world’s celebration of the sounds he was able to create. The 16 Grammy Awards plus the first classical “Gold Album”, selling more than one million copies, attest to his 60-year career. Posted on November 4, 2017 by Web Master and tagged Atlanta; GPB; PBS; Morehouse: ASOC; Symphony Store; awards. "If you doubt any one person can change the world...."
From the August 29, 2017 edition of the Macon Telegraph. "One of the biggest upcoming music events will take place on the silver screen rather than the stage. The Macon Film Guild will present the documentary “Robert Shaw – Man of Many Voices” at the Douglass Theatre on Sept. 15. The screening will be preceded by a performance by the Wesleyannes and Nadine Cheek; the latter will discuss her own vocal relationship with the great man. If you doubt that one person can change the world, you’ll want to see the story of Robert Shaw." Posted on August 31, 2017 by Web Master and filed under News and tagged Macon Telegraph 2017 Douglass Theatre Wesleyannes Nadine Cheek Robert Shaw Man of Many Voices. Breckenridge Film Festival. See the film in Colorado! Another great film festival has selected Robert Shaw - Man of Many Voices for its 2017 line-up. The 2017 Breckenridge Film Festival will be from September 21st through the 24th and the RS-MoMV team is very excited. One of the oldest film festivals in the country, the Breckenridge Film Festival (www.breckfilmfest.org) has been around for 36 consecutive years presenting "an annual celebration of independent film" and has an excellent reputation. There have been many well-known names at this festival over the years. Plan to be in the area that week? Join us or tell your friends there. We love seeing familiar faces at the screenings and during the Q&A afterward. Or meeting new ones! Posted on June 29, 2017 by Web Master and filed under News. L.A. Beat's Film Review. That Last Paragraph. Wow! This just in folks. A review of Robert Shaw - Man of Many Voices in the L.A. Beat. I don’t know if Springsteen ever met Robert Shaw but in those 56 words he summarized the life of that brilliant artist and human being shown so eloquently and beautifully in the 71 minute film ‘Robert Shaw: Man of Many Voices’ screening twice next week at the Newport Beach Film Festival, taking place at various venues around that city and at the Segerstrom Center in Costa Mesa. A self taught master, Shaw studied religion at Pomona College with an eye towards following his fathers footsteps as a minister. After his graduation in 1938 the hardships of Great Depression and his fathers debilitating illness forced Shaw to rethink his plans and accept an offer he had previously rejected (to come to New York and create a chorus at NBC Radio Studios) from nationally famous bandleader and radio personality (and owner of the company that produced the kitchen implement later memorialized in Warren Zevon’s ‘Poor, Poor Pitiful Me’!) Fred Waring. In that setting Shaw’s untutored brilliance quickly propelled him into the national spotlight and his vocal ensemble would perform 500 live shows in a year and see him deliver the largest audience for a radio program in that medium’s history. For Shaw, that was only the beginning. With a social circle that included Orson Wells, Charlie Chaplin, Martha Graham, Arturo Toscanini and Dylan Thomas (Shaw was a regular at New York’s famous White Horse Tavern and was drinking with Thomas the week the poet died) Shaw became as respected for his talent and art as any of that crowd. He outlived them all, and arguably touched more lives in live performance than any of them. After transitioning under the guidance of Arturo Toscanini and George Szell from being a purely choral conductor to leading full orchestras, Shaw was asked to lead the Atlanta Symphony Orchestra, which he built into one of the world’s great performing ensembles. Shaw conducted the Atlanta Symphony at the great concert halls around the United States and around the world. The importance of art as a tool for building bridges is told wonderfully in vignettes about performing with an integrated chorus in the segregated south, playing Bach’s Mass in Bm in Leningrad during the Cuban Missile Crisis and bringing an American orchestra to offer up Beethoven’s 9th Symphony to a teary eyed audience in East Berlin. It was under Shaw’s direction in 1978 that the ASO presented the first digitally recorded classical performance – Stravinsky’s Firebird Suite. In Robert Shaw: Man of Many Voices we are taken on a journey not only into the life of one of the greatest artists of his or any age, we are given an eloquent and simple understanding of the meaning and purpose of art: ‘Art binds people together at their own eventual best, their own eventual goodness . . . (and) builds a tolerance for other human beings that is essential to a civilization.’ Sound familiar? In the very best tradition of documentary filmmaking, Robert Shaw: Man of Many Voices, not only illuminates an important human being and his era, it illuminates what is important today and tomorrow and forever – if we are fortunate enough to continue the human experiment. Whether you are an artist working in any media — or if you simply love art – I’m betting you will find this film a meaningful, inspiring and life affirming work. Posted on April 22, 2017 by Web Master and filed under News and tagged LA Beat James Eliopulos Newport Beach International Film Festival Film review Stravinsky Firebird Suite ASO East Berlin Cuban Missile Crisis Bach Mass in B minor' Toscanini Szell Waring Zevon NBC Radio Studios Dylan Thomas White Horse Tavern Bruce Springsteen Streets of Philadelphia 65th Annual Academy Awards. With over 350 films being screened at the 18th annual Newport Beach Film Festival, The Orange County Register, a paid daily paper in Southern California with more than 350,000 subscribers, has identified Robert Shaw - Man of Many Voices - as one of its three picks to see. “'Robert Shaw: Man of Many Voices' (6 p.m. April 25; 8:15 p.m. April 27): This documentary about the California-born, multi-Grammy Award-winning composer Robert Shaw features interviews and commentaries from President Jimmy Carter, Walter Cronkite and Yo-Yo Ma. Co-writer, director and producer Kiki Wilson sang with Shaw’s chorus for the last 18 years of his life. 'During the last years of his life, when he was at the height of his musical intelligence and experience, Talarc (sic) Records gave him the green light to record whatever it is he wanted to record. They so trusted his artistic output and his maturity and they didn’t care about his commercial success,' Wilson said." Posted on April 13, 2017 by Web Master and filed under News and tagged Orange County Register Kiki Wilson Telarc Jimmy Carter Walter Cronkite Yo-Yo Ma Newport Beach International Film Festival. April 11, 2017 – Robert Shaw - Man of Many Voices has picked up the Best Documentary award at the Palm Beach International Film Festival and selected one of the Best of the Fest by the American Documentary Festival (AmDocs). In February, the Atlanta-produced film won the Gold Award from the Los Angeles Film Review’s 2017 Independent Film Awards as well as the Best Documentary award from the Beaufort International Film Festival. Next stop: the Newport Beach International Film Festival (April 20 -27th). The film, about the extraordinary life of the internationally revered choral and orchestral conductor, is the first film from executive producer, Kiki Wilson. Ms. Wilson sings alto with Shaw's celebrated Atlanta Symphony Orchestra Chorus (ASOC) and was with the chorus through many of the Shaw years. Robert Shaw is the icon of choral music. The 16-time Grammy winner entered the world of pop music with no formal training and yet was on national broadcasts by the age of 22. With even less training, he later decided to move into classical music where in spite of all odds he conducted some of the most remarkable music performed in the 20th century. The documentary includes interviews and commentaries from, amongst others, President Jimmy Carter, Walter Cronkite, Syvia McNair and Yo-Yo Ma. Robert Shaw’s impact went beyond the musical world and into civil rights arena as well. The film explores his forays into the South with racially integrated choruses as well as his reasoning for bringing his already impressive musical influence to Atlanta in the 1960s. Director, Peter Miller, whose films, including AKA Doc Pomus, Jews and Baseball: An American Love Story, and Sacco and Vanzetti, have screened in cinemas and on television throughout the world. He has also been a producer on numerous landmark PBS series directed by Ken Burns and has been nominated for a Daytime Emmy for A Gift of Love: The Daniel Huffman Story. Emmy Award winning actor, David Hyde Pierce, narrates the film from Mr. Shaw’s modest beginnings through his improbable but meteoric rise to national stardom and international acclaim. The choral world’s fascination with Robert Shaw’s techniques are only slightly matched by the music world’s celebration of the sounds he was able to create. 16 Grammy Awards plus the first classical “Gold Album”, selling more than one million copies, attest to his 60-year career. Posted on April 13, 2017 by Web Master and filed under News and tagged Palm Beach Palm Beach International Film Festival American Documentary Film Festival AmDocs Los Angeles Film Review Beaufort Best Documentary Best of the Fest Newport Beach International Film Festival Gold Award David Hyde Pierce Robert Shaw Peter Miller Kiki Wilson AKA Doc Pomus Jews and Baseball Sacco and Vanzetti. UPDATE: Snowstorms have a way of interfering. February's chilly blast through the upper northeast stranded Dr. Jones and motivated Westminster Choir College to postpone their screening of Robert Shaw - Man of Many Voices so that Dr. Jones could be available to lead the sight singing and to speak of her work with Mr. Shaw. The new date is April 7th. Presumably the chance of snow, ice and wintery bluster will be minimal at that point. All other details for the event remain the same. Westminster Choir College in Princeton, New Jersey is hosting a screening of Robert Shaw - Man of Many Voices on Friday, February 10th at 6:30 PM in Westminster's Hillman Performance Hall. Dr Ann Howard Jones will lead a reading of four selections prior to the screening and will offer some insights on the documentary and on Mr. Shaw. She will also address questions after the film. If you're in the area or know someone who is, this is a rare opportunity to see this excellent movie. Which, by the way, has been accepted into Beaufort International Film Festival in South Carolina, the American Documentary Film Festival (AmDocs) in Palm Springs and the Palm Beach International Film Festival in Florida. Look for it there! Posted on February 8, 2017 by Web Master and tagged Westminster New Jersey Princeton Ann Howard Jones Beaufort AmDocs Palm Beach.